I am SO excited about these. Let me gather myself, or medicate or something before I get started! The possibilities with these are endless, colors, flavors, fortunes, ACCKK!! Only in America can we get this little gem for dessert at a Chinese restaurant, but they don't serve it in China! HA! Fortune cookies are as traditional as pumpkin pie in the United States. They were allegedly created in California, but many different people claim to have made the first ones. It doesn't really matter to me, what baffles me is how many different ones I have eaten. Some are sweet, some are not, some taste like paste, some taste like vanilla, some are light golden, some have been brown, but didn't taste of chocolate. I mean, it is crazy how many versions of these there must be in the world! And don't even mention that little "add ons". You know the little words you add on to the end of your fortune?! I know you know what I am talking about! If you don't have a buddy to help you, please only make 2 at a time. They MUST be hot, (I burned my hands) when you form them or you get a cracked mess! You can purchase white cotton gloves that would make these much easier on your hands. I think these would be adorable if you use food coloring, you can tailor them to any occasion or event. The fortunes could be advice, questions, etc. I just think they could be adorable for so many events!! 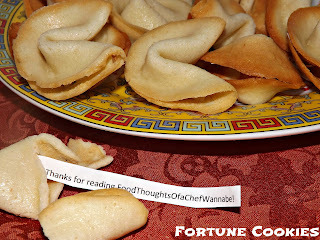 I couldn't help be want to try these, it was so fun printing different "fortunes". They take a little fanangling but are so well worth the time!! Enjoy these sweet, vanilla-ee, crunchy treats!! -12-14 "fortunes" written or typed out and cut into as small of a strip as possible, you may have to fold them in half, it is no biggie! Preheat your oven to 300 degrees. In a small bowl whip egg whites until frothy. Add in the rest of the ingredients and whisk until a smooth batter forms. I sprayed my cookie sheet a few times but, likely didnt NEED to. You have to work really fast here. I did 2 cookies at a time, trust me, it is best. If you have someone to help you, maybe 3 at a time. Use a tablespoon worth of batter (approx), using the back of the spoon spread to about a 3 inch circle. It should be really thin and you can see the pan through it in some parts. Bake for 10 minutes, the edges will be brown. Take them out, working like a MADWOMAN or MADMAN, use a spatula to get them up, flip them over and put your fortune in the center, fold in half and then bend in half over a cup. Here is where I really messed up. I forgot to take photos of the process!!! ACK!! I was able to snap a few after to demonstrate as best as I could! There are many YouTube tutorials on it if you can't figure it out. This recipe, I changed up a bit is the only one that I found came out really crispy when completely cooled. These are delish and you could dip them in chocolate, use food coloring to make colored cookies, or use lemon or orange or lime juice instead of water. The possibilities are endless, I just chose to go with a traditional cookie the first time around! Chris oh my goodness!! I absolutely love this!! I'm going to be sharing! !